Our airport transfers to Val Thorens, Les Menuires and St Martin will take you straight into the heart of the resort and take little more than two and a half hours from either Geneva or Lyon when the roads are clear. Transfers start from 50€ per person from Geneva so simply fill out our Quick Quote calculator to find out more. Val Thorens is a difficult resort to beat, as it offers some of the best snow in the Alps. The benefits include a wide variety of terrain to suit all standards, plenty of snow and North-facing slopes. 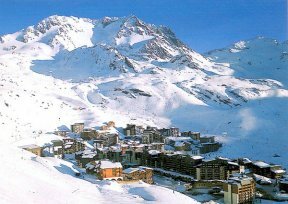 Due to its unique situation, the village of Val Thorens is located right in the heart of the skiing. It simply doesn’t matter where you stay as the slopes are virtually on your doorstep. 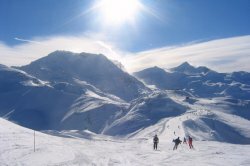 The Val Thorens domain also boasts an impressive 1430m vertical drop (from 1800m-3230m) and the resort now offers a Snow Guarantee during the winter months. 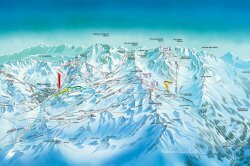 The resorts of Val Thorens, Les Menuires and St Martin are linked to the largest linked ski area in the world: les Trois Vallees, with 600 kilometres of prepared and maintained pistes. The magnificent scenery stretches from the Mont Blanc massif in the north to the Les Ecrins massif in the south. After a few hours on your skis and you'll reach the summit of the the Trois Vallées massif, the Pointe de Thorens (3266 m) at Val Thorens. Live bands, DJs and karaoke nights are all popular and there are plenty of places to grab a drink and something to eat after a day on the slopes. Val Thorens has plenty of French, Irish, English and Dutch bars to choose from, Le Saloon and the Frog and Roastbeef being two of the most lively venues. If partying in Les Menuires you should head to the Croisette for bars and nightlife, whereas St Martin has the Dahlia and the Pourquoi-Pas to name but two. If you're curious to know what's been said about Val Thorens as we speak then have a look at the Twitter feed below. You can also keep up-to-date with all of our news and special offers by following us at @3vtweet.